FRIDAY COCKTAIL - HOLIDAY HOPPER! This is a take on the traditional grasshopper cocktail with a twist. So rich and creamy with the creme de menthe and white creme de cacao....not especially low calorie, but IT'S THE HOLIDAYS!!!! Pour all ingredients into a cocktail shaker with ice. 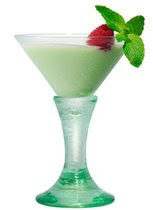 Shake well and strain into a martini glass and garnish with mint and raspberry. FRIDAY COCKTAIL - CANDY CANE! Hope everyone had a marvelous Thanksgiving. I certainly did! Now begins all of our Christmas Holiday cocktails...yum! This makes a great pre-dinner cocktail or a perfect after dinner sweet! In a shaker with ice, combine vodka, schnapps, white creme de cacao and grenadine. 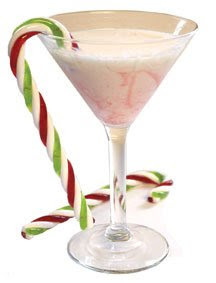 You can either crush the candy cane and rim a martini glass with it or hang the cane on the side of the glass as a garnish. Pour the vodka mix into the martini glass, fill with cream and add a splash of soda water.